By most, this is considered a weed. We consider them as that annoying plant that is usually found between the cracks of a sidewalk or laying comfortably in a yard or on your lawn where it's unwelcome. For years people have visited hardware stores in search of a weed killer - but believe me these provide more good than harm. The unconventional attitude towards Dandelions is of nutritional value and its prized medicinal properties. This is a matured flower head. It takes the shape of a sphere containing many single-seeded fruits attached to fine hairs. This is how dandelion spreads itself. These are yellow (to orange) in nature. The petals forming the head are arranged in a dome shaped manner. Hollow stem consisting of a milky sap. Stems don't branch off - each stem solely holds one flower head. Stems can grow 5 - 70 cm long. It's all in a name! Dent-de-Lion (Lions Tooth) resemble the jagged edged leaves that taper at the tip. They usually lay flat to the ground and are formed in a circular arrangement (rosette). Unlike some other plants mistaken for dandelion, leaves of dandelions are hairless . The rosette can hold as much as ten stems. Dandelion leaves & stems grow from a taproot. This root type grows vertically down, tapering at the end forming a center where secondary roots sprout laterally. Leaves: bitter glycosides, carotenoids (including lutein and violaxanthin), terpenoids, choline, potassium salts, iron and othe minerals, Vitamins, A, B, C, D (the vitamin A content is higher than that of carrots). Root: bitter glycosides (taraxacin), tannins, triterpenes (including taraxol and taraxsterol), phytosterols, volatile oil, choline, asparagine, carbohydrates (including inuli), pectin, phenolic acids, vitamins, potassium. Laxative - Stimulates or facilitate evacuation of the bowels. Aperient - Used to relieve constipation. Cholagogue - Promotes the discharge of bile from the system, purging it downward. Tonic - Benefits entire body. Strengthens organs that are affected by the action of the digestive system. Stomachic - Promoting the appetite or assisting digestion. Antioxidant - Inhibits oxidation & removes potentially damaging oxidizing agents. Considering all the actions dandelion has on the body it seems reasonable to say that it could play a major role in preventing the formation of cancer. chain of bacteria that keeps your gut healthy and alleviates digestive problems. Note: inulin found in processed foods may not have same affects as those found in directly consuming vegetables. Because inulin is not digested & absorbed, it does not affect blood glucose levels. This makes it an appropriate food for diabetics. It is not counted as carbohydrate intake but is filling like starchy food. Adding inulin to calcium-rich foods like yogurt may boost calcium absorption. 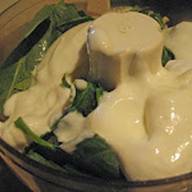 Try a yogurt dandelion salad. 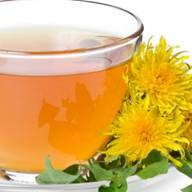 Dandelion tea can bring considerable relief from bloating and breast tenderness, as soon as symptoms are felt. To help keep liver at peak efficiency & use preventative measurements, dandelion root tea of dandelion plants should be eaten regularly. The greens leaves help maintain alkaline levels in body. Alkalinity is also considered to be a bad living environment for bad bacteria - which will help in preventing diseases. The bitter aspect of dandelion helps stimulate digestion. ** Before consumption of the Dandelion plant, Verify that the dandelions have not been treated with chemicals. Avoid eating any chemically treated plants - they are dangerous to your health. ** Make sure leaves, flowers & roots are thoroughly cleaned before use. Add fresh honey to taste & Chill. 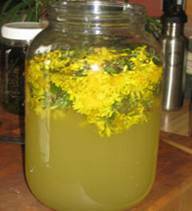 Speaking of dandelion drinks check out dandelion beer & dandelion wine or dandelion liqueur: Dandelion flower - half cup of sugar - a long strip of lemon peel – vodka Prepared as the tincture!! 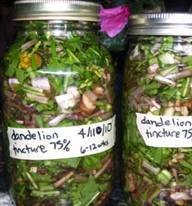 In six to twelve weeks, strain out the dandelion pieces and put the finished tincture into jars. Take a few drops daily in water as a tonic for good health! 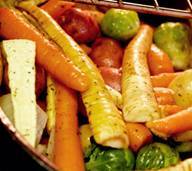 Whether it be next to a chicken or roast beef or even steak, Roasted root vegetables are always good. Why not introduce a new root to this medley of roots. Now it’s not just carrots, & potatoes that you can use, but even Dandelion roots. Boil dandelion blossoms & water (4 min) then strain. 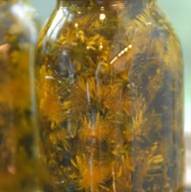 Combine dandelion liquid and pectin. - Rolling boil, stirring constantly. Add sugar; return to a full rolling boil. Boil for 1 minute; stirring constantly. Remove from the heat; add extract. Skim off foam. Ladle hot mixture into hot sterilized half-pint jars, leaving 1/4-in. headspace. Remove air bubbles; wipe rims and adjust lids. Process for 5 minutes in a boiling-water canner. Yield: about 6 half-pints. 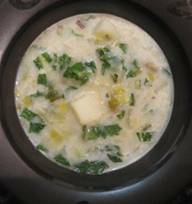 Soups & Stew is also a great way to enjoy this medicinal plant. Also remember that dandelion doesn’t have to be centre stage in your dish. If you’re just starting out with this plant, then try to incorporate it into your foods as complementary to the main food in the dish and then expand from there. Get your palate used to the taste. Options are endless with this great plant. Roots, Leaves & Flowers can all be used here. And options as to what to mix them with are all upto your taste buds. I usually always go with a lemon/garlic base for the dressing. (I feel it goes best with dark leafy greens). 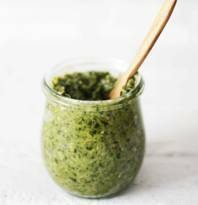 But, so as to not get bored of the same dressing, I incorporate other things to this base (Spices or Sesame Oil for an Asian kick or even roasted red pepper paste) The options are endless! I say this can be done with any herb or plant. Nuts usually taste great with any dark leafy plant, so it should work with dandelion leaves. 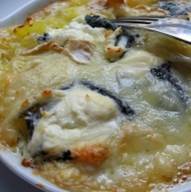 Whether it be the main ingredient or an extra ingredient Dandelion can be incorporated easily in foods like the Gratin. 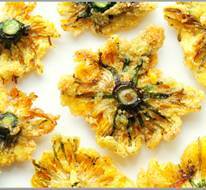 You can even add them to fritters, or egg dishes such as omelet or scrambled eggs. The options once again are endless. Dandelion flowers, flower buds, roots or leaves can be used. 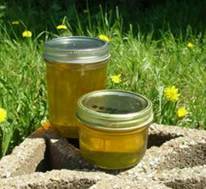 This is one of the easiest forms of obtaining the benefits of dandelion. Great for weight loss or as a treatment for cholesterol & more. Made by drying the roots then roasting them till fully brown. Ground up & steeped.e with constant mixing. Then it is dried & ground into a powder. 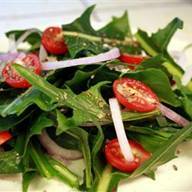 Since Dandelion is known to help absorption of calcium, then why not take advantage. 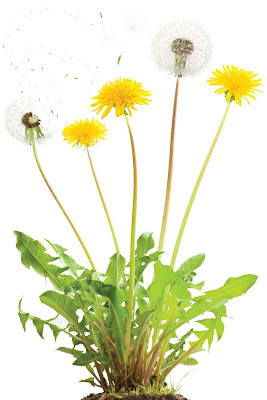 Mix a little calcium with your dandelions to get the best out of both. I usually find dark leafy greens taste good with yogurt (definitely the homemade yogurt – sour & salty) not the sweet one. My parents usually chop dandelion leaves & add Kishk to it. Kishk is of Lebanese & Syrian culture. Burgul (cracked wheat) is mixed with yogurt & whey & left to ferment for a week’s time with constant mixing. Then it is dried & ground into a powder. So after seeing the turmeric infused oil, it’s quite simple to say that you can infuse oil with almost anything you’d like. So why not do a dandelion infusion. Cover with cheesecloth & put in a warm sunny place. Last but not least, who can forget the best thing about a dandelion? It’s its ability to keep you entertained, while allowing you to wish endlessly. Just as my nephew calls them SPRINKLY WISHES - You make a wish, you blow & wishes fly away sprinkling the air! Here’s to dreaming & hoping. And all along it was right under our noses. d-WINE OIL SALAD MOST BENEFICIAL. mANY USES . CHEERS t.K. I have ckd stage 3 and after eating dandelion lion flowers for the past week I am leaking less protein. Just my experience. Aloe?? How do you do? An Artsy Cancerian who's pleased to help others & loves to protect. Listening is my strength. Natural Healing is my goal. I'm a mind of constant thought. I hold a strong belief in the efficacy of natural medicine and the healing power of nature; and with the concern for others, I always look forward to applying my skills for the well-being of others by promoting health, and disease prevention. To add to the creativity I have a hidden passion for art. Self taught, I love to paint, draw, sculpt and photograph as I please. Cooking allows me to address my love for health - It's my art to health... I sculpt and mold the food to end up with a recipe. As each individual is different, No warranty or guarantee of a cure is expressed or implied with any information on this site. Ingenious Health © by Dareen AbouShackra...... Powered by Blogger.